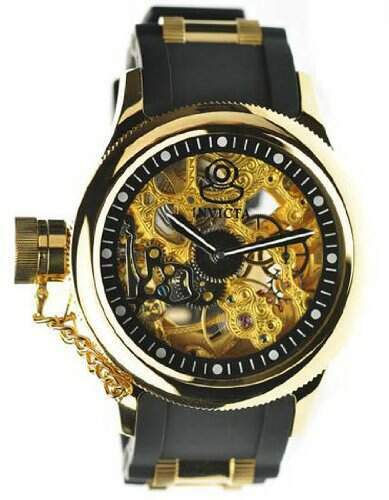 Stainless steel case with a black rubber strap with gold-tone center links. Fixed gold-tone bezel. 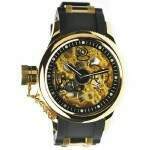 Gold skeleton dial with black hands and dots hour markers. Minute markers around the outer rim. Dial Type: analog. Luminescent hands and markers. Mechanical movement. Scratch resistant flame-fusion crystal. Push / pull crown with protective cap. Exhibition case back. Case diameter: 42mm. Case thickness: 16mm. Tang clasp. Water resistant at 50 meters. Functions: hours. minute, seconds. Sport watch style. Invicta Russian Diver Gold Skeleton Dial Mechanical Ladies Watch 1844.